Set in Manhattan’s Sterling Cooper advertising agency, the show is a vivid snapshot of life in another era. Advertising creative director Don Draper (Jon Hamm) is the series lead, and despite his complete lack of outward emotions, Draper is one of television’s most complex and intriguing characters (rank him up there with The Sopranos’s Tony Soprano, The Shield’s Vic Mackey and Rescue Me’s Tommy Gavin). He’s an alcoholic, tormented adulterer. He’s also brilliant, refined and amazingly slick. Draper’s surrounded by a myriad of colorful characters (at work and outside of it), each desperately (and quietly) trying to claw their way out of their own personal, private prisons. Although there are no high concepts or looming, tension-filled serialized arcs to the series, Mad Men’s second season was rife with social and political themes. While season one touched on everything from alcoholism, sexism, racism, consumerism, and homosexuality, season two shifted its focus to more of the times’ brimming themes; youth, the growing civil right movement, free love, increasing feminine discontent, and the looming threat of nuclear obliteration. The show is out to raise social consciousness and make its viewer think yet not be heavy-handed about it. On an equally profound level, Mad Men is also an impressive study in humanity, digging deep into its characters’ worlds and holding up a magnifying glass to their strengths, weaknesses, fears and motivations. The result of this dual-level execution is an oddly gripping drama that doesn’t even boast anything close to resembling any form of action setpiece. Imagine that. 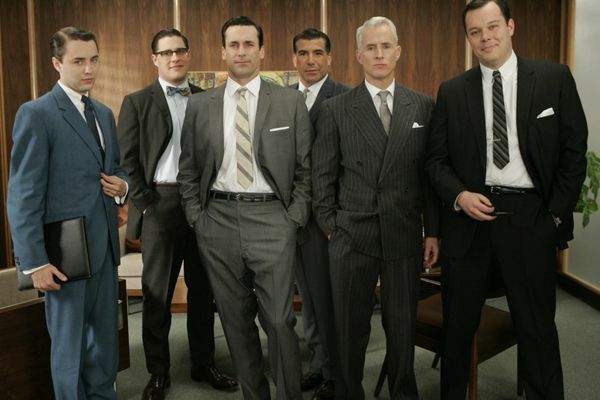 Mad Men’s other greatest strength is in its deep nuances and attention to detail of the period. The show isn’t just set in the 1960s, it lives and breathes there. 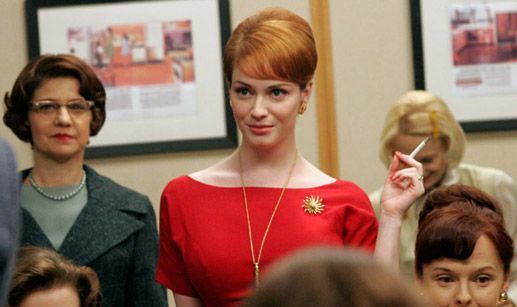 From the larger specificities (like office and home furnishings) to the tiny ones (a doctor puffing a cigarette, to name just one), Mad Men gets it right, resulting in a show that looks and feels like nothing else that’s been on television before. The episodes themselves, each one more standout than the next, are fine-tuned like the components of a stopwatch. A melancholic, thoughtful tone pervades the material and even though the show is soap, the drama plays as more authentic than cheesy. It’s compelling to watch Don’s marriage to Betty (January Jones) enter a crossroads. This element of his life weighs even heavier on his business trip to Los Angeles where he faces an even more potent existential crisis. Other storylines, like Sal’s (Bryan Batt) struggle with his repressed homosexuality and Peter Campbell’s (Vincent Kartheiser) realization that he’s in love with a woman who’s not his wife are equally compelling. The four disc set is stocked with a plethora of extras. Although the documentaries are periphery to the show (they’re primarily vivid portraits of the era, paying particular detail to the feminist movement), the commentaries (every episode’s got two!) range from insightful to irreverent. Each episode has a producer track and an actor track (sometimes the two overlap). Most compelling to is Creator/Executive Producer Weiner, who has such a firm grasp on the show and its characters, it’s almost like listening to an artist give a lecture about their work. The second season box set’s a must-have for any fan of Mad Men, or great television, for that matter.